JoeAs smooth as the preparations for moving had gone, I was apprehensive on a few fronts as we actually approached the day itself. Some of my worry centered around renting a moving truck in a foreign country I had never driven in before, but primarily my concerns were temporal. The problem is that Swedes appear to have no notion of pro rating; apartment companies expect you to pay a full month's rent for each calendar month you live in the apartment, so even if you keep the apartment for only one week in July, they want rent for the whole month. As a result of this, there are pretty tight tolerances on apartment-to-apartment moving here. If your lease is paid until the end of June, you have until noon on July 1 to turn in the key to your empty and cleaned apartment; unfortunately for you, the possessors of the apartment you are moving into also have until noon to turn in their key, so there's no period of overlap during which you can start to move some of your stuff. We had it a little easier than most, as our Flogsta apartment was a second-hand lease, and our "landlord", F., didn't need us to be out before the evening of the first. However, truck rental isn't cheap, so we didn't want to have a truck overnight. So, we had to load and unload everything between 9 AM and 5 PM, while also cleaning, turning in our old keys and getting the new keys. Truck rental turned out to be the easiest part of the day. Most vehicle rental in Sweden is done through gas station chains such as Statoil, Hydro, or OK (I chose the latter, as they sponsor the women's soccer league in Sweden), and rentals can be booked online. OK even had some information available in English, unlike their major competitors. I wound up with a mellanlast, which had a listed cargo capacity of 8 cubic meters. I had seen some OK trucks around the complex that looked just like the picture on the website, and they seemed plenty big enough to hold our various bits of Ikea. A closer look at those trucks I'd seen would have revealed that they all were 12 cubic meter storlaster, not what I had rented at all. This I did not discover until the night before we moved, far too late to change the reservation. 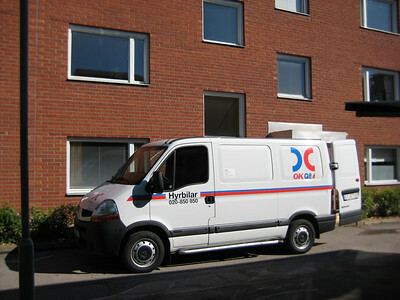 Would we fit in an 8 cubic meter truck? If not, we'd just have to make two trips, something I'd have preferred to avoid. Tuesday morning dawned bright and sunny (early too, since the curtains had been packed away monday afternoon), which was a relief after 5 days of never ending grey skies and cold rain. I hopped on my bike first thing and made for the OK station where our truck waited, about 30 minutes away by bicycle (the marker for this post points to the OKQ8 station in question). They had no problem with my foreign drivers license, but they didn't care much for my Swedish credit card as it doesn't have raised numbers (car rental companies the world over seem to have strange ideas about credit cards). Fortunately my US card was handy, so ten minutes later I had keys, a bunch of Swedish instructions, and… well, a truck, in theory, although 10 minutes of searching on my part failed to locate it. Turns out it just hadn't been brought out that morning, so a few minutes later I was on my way. It had occurred to me as I left the house that perhaps I ought to read a bit about Swedish traffic laws before driving across town. Luckily for me Vägverket maintains a small series of online traffic regulation brochures which cover dealing with pedestrians and bicyclists, roundabouts, and so forth. What they didn't mention was that the truck would have a manual transmission, although I suppose I should have expected it. Anyway, I mostly followed the bus route home, navigating the several roundabouts as instructed (the rules were essentially: signal to exit, but never to enter, choose the lane that works best for you, and don't run over anyone). I did the loading myself, while Jennifer cleaned the apartment, and by 11:30 we were all packed up. 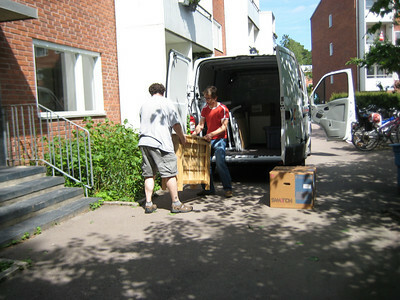 It turns out that we currently own exactly 8 cubic meters of stuff. So Jennifer headed to the Studentstaden offices to get the keys while I finished up at home. This is when it turned out there was something we had failed to consider: when we had last been in the Studentstaden offices, we noted the huge, empty lobby, the many unstaffed workstations, and the complicated queue number machine, but we had chalked it all up to social over-engineering. Not so. On the first of the month, there are dozens and dozens of people who all want to drop off and/or pick up keys, all at noon. Jennifer arrived a few minutes before noon itself, and drew number 536, with 498 being currently served. They did seem to have a pretty good system though, involving at least three employees helping each person, checking info on the computer and matching it up with a ziplock baggy holding the appropriate keys, fetched from some sort of vault in the back. So by 12:45 she was out the door. For the unloading we had the assistance of G., our Swiss friend of stuga fame, so it went remarkably fast, so fast that he hung around after to help reassemble most of the furniture. By 3:45 we were back on the road, dropping Jennifer off at the old place to finish up while I took the truck back, planning to meet F. to return the keys at 5. That would have been fine if I hadn't wound up in a left turn only lane at Drottningsgatan which took me across the railroad tracks, a situation which simply cannot be remedied any longer in downtown Uppsala due to the 5 year construction project on the railway station. I actually had to drive south all the way out of town before I could turn back right onto Kungsgatan, but I managed to get the truck back a few minutes before 5, and we had used so little gas that they didn't even charge us for it. Then I had to pedal as fast as my little legs would carry me back to the apartment. Turns out I could have taken it a little easier, because Jennifer, being more realistic than yours truly, had rescheduled the key exchange for 5:30. Anyway, by 7 we were back at our new place. At 8, G. and his girlfriend D. came over and brought us dinner, which G. claims is a Swiss tradition after you help someone move. Tradition or no it was much appreciated, and we had a fun first evening in our new place, eating beer, drinking pizza, and then horrifying G. and D. by playing a few selected mashup tracks. No worries, though, as in retaliation, they introduced us to this little wonderment.